I'm using visual studio 2015 community edition blend on a windows 10 machine. I have a project for which I have the propertiespage/web/startaction set to current page. When I select the aspx item I want to debug and start debug the debugger displays the the localhost -/ directory listing instead of loading the page I want. If I select on of the items from the directory listing that item is loaded into debug. If I specify a page in the project as being the start page and run debug that page is loaded correctly. Can someone kindly explain what I need to do to get the debugger to load my current page instead of displaying the directory listing? 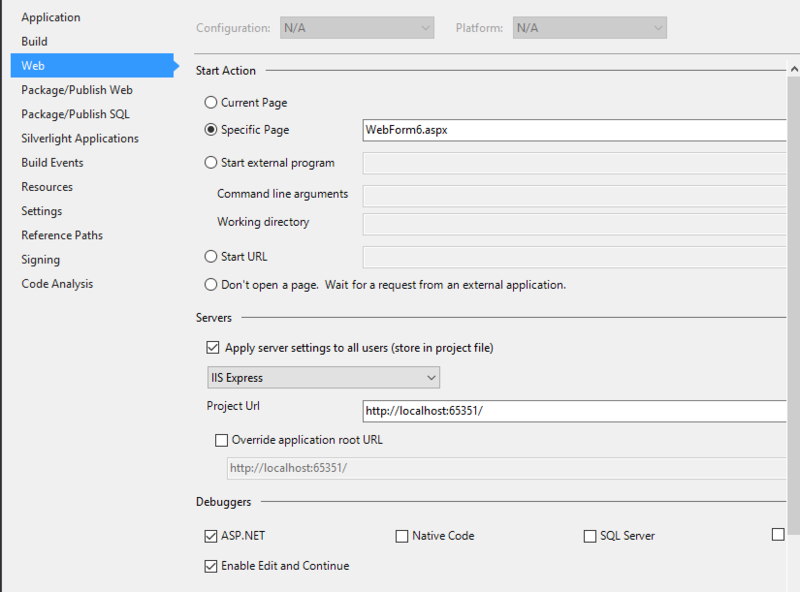 Do you set the IIS Express as the server in your VS IDE? Do you set the Specific page like the following screen shot? Start Debugging (F5). This option runs the web project in the browser and allows you to perform debugging tasks such as stepping through code and stopping at breakpoints. Start Without Debugging (CTRL+F5). This option runs the web project in the browser without using the debugger. It approximates the user experience. View in Browser (CTRL+SHIFT+W). This option runs a selected page in the browser. Debugging breakpoints are not in effect even if debugging is enabled. Hi Chris, Thanks for the quick reply. I'm used to using VS premium in that version if you highlight the tab in the editor with the page you want to debug and start the debugger the highlighted tab is the one that gets debugged. Looks like the community edition behaves differently that way. It's kind of inconvenient to have to specify a page as the start page every time you want to debug the page.